Five secret documents dating back to 1982 revealed clear US involvement in the Sabra and Shatila massacres that took place in 1982 over a three-day period from September 16-18. 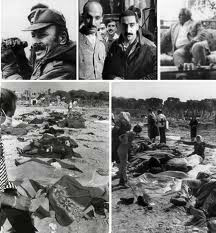 The documents include verbatim transcripts of meetings between US and Israeli officials before and during the three-day massacre led by the right-wing Lebanese Christian Phalange militia that left roughly 2,000 people dead, mostly children, women and elderly men, New York Times revealed on the 30th anniversary of the Sabra and Shatila massacres. The documents revealed that the Israelis misled American diplomats about events in Beirut and bullied them into accepting the spurious claim that thousands of “terrorists” were in the camps,” Seth Onziska, a doctoral candidate in international history at Columbia University and who obtained the documents, reported. “Most troubling, when the United States was in a position to exert strong diplomatic pressure on Israel that could have ended the atrocities, it failed to do so,” the newspaper added. On 16 September 1982, the first day of the massacre, US envoy to the Middle East Morris Draper met with Israeli Defense Minister Ariel Sharon who justified Israel's occupation of west Beirut by claiming that “2,000 to 3,000 terrorists” remained in that part of the city. According to the transcripts, Draper continued to insist that the Israelis leave, but eventually backed off once they agreed to a “gradual withdrawal” to allow for the Lebanese Army to enter the city. The Israelis insisted, however, that they wait 48 hours before allowing the plan to take effect. Britain went out of its way earlier this month to condemn the 1972 killing of 11 Israeli athletes, but it has failed to even raise the horrific Sabra and Shatila massacre of more than 3,000 Palestinian and Lebanese civilians by Israeli-affiliated terrorists ten years later. The Israeli regime unleashed Phalange terrorists on Muslim residents of Sabra and Shatila refugee camps in the Lebanese capital of Beirut between September 16 and 18, 1982. The terrorists entered the refugee camps, supposedly guarded by Israeli regime’s forces, on September 16, while Israeli troops fired flares to help attackers in their butchery of innocent Muslims including scores of children, women and old men. As many as 3,500 people were slaughtered with many women raped before being killed. In December 1982, the United Nations General Assembly condemned the massacre in Resolution 37/123 with a massive 123 yes votes, without any opposition as an act of “genocide,” for which the Israeli regime was implicitly blamed. However, Britain joined hands with its western allies the US, Germany, Canada and France to abstain on the resolution apparently because Tel Aviv was indirectly blamed, while later in February 1983 the Israeli regime found -- in what British journalist David Hirst called a flawed inquiry full of omissions of evidence to rid the regime of full responsibility for the massacre -- that its forces were “indirectly” responsible for the butchery. Nonetheless, Britain seems not to include victims of Israeli state terrorism in its list of terror victims, nor consider Palestinian and Lebanese civilians massacred by the regime both in 1982 and later in the 2008 Gaza Massacre as worthy of a “sad” remembrance. A Palestinian woman carries portraits of her relatives who were killed during the Sabra and Shatila massacre during a march to mark the 30th anniversary of the massacre in Beirut. On Sunday, the 30th anniversary of the Sabra and Shatila massacre was commemorated by people of different nationalities around the world. In Lebanon the commemoration was only observed by Palestinians living in refugee camps; Lebanese people were not concerned. The massacre carried out by the Phalange, a Christian Maronite militia acting in full cooperation with Israel, was among the most atrocious episodes of recent history. But it is still absent from our collective Lebanese memory. The Sabra and Shatila massacre is another taboo in Lebanon that needs to be addressed publicly and soberly; maybe admitting the wrongdoing could prevent us from further subjugating the Palestinian refugees who are residing here temporarily until they return to their occupied homeland. The perpetrators of the massacre are still alive and could be found inside and outside Lebanon; so too are some of the witnesses who survived the massacre, and lost their loved ones. They are still awaiting justice. On 16 September 1982, Jameela Khalifeh was a teenage girl. The three long days of slaughter still haunts her memories. This week, Khalifeh welcomed us with a smile to her dim apartment on the busy Sabra strip. Outside, there was bustling life: people stopping and shopping at vegetable stalls and bootleg DVD stores. “On 16 September, during the invasion, Israeli soldiers descended onto the camp from the Sports City stadium located on a hilltop overlooking the camp. We knew that the Israelis were stationed in the stadium and they [the Israelis] knew that the fedayeen [PLO fighters] had evacuated the camp, therefore we assured each other they wouldn’t kill us unarmed families. “Next to the Israeli soldiers there were the Phalange militants who spoke in a Lebanese dialect; each militant dressed in a cowboy hat and a white armband with a green cedar on it [the logo of the Phalangists’ political party]. I remember the Israelis were speaking broken Arabic to the Lebanese militants but mostly they spoke in Hebrew. My mother understood Hebrew from the time she used to live in Palestine before 1948. “Overwhelming stench” “We came out from the shelter to the street; I remember the stench was overwhelming, and I was waving a white piece of cloth. My father finally decided to come out with us from the shelter. I made sure to stay by his side; I was truly attached to my father, holding his hand tight. “The moment we emerged we were taken by Israeli soldiers and Lebanese militants. At this point my father became nervous. He looked at me and whispered, ‘I’m going home.’ The moment we joined families from the camp led by the militants, my father panicked, let go of my hand and ran home. When he got home he found militants inside the building, searching it, so he immediately ran back to us. “While he was running towards us: they shot him in the head. My mother saw him getting shot, I didn’t. “While we were being led at gunpoint, we found a small alley that led to the camp so we split off from the marching, cattled crowds and made it back to the main mosque in the camp. The mosque was full of people from Shatila. On arrival, we told them that they [the Phalange] are killing and slaughtering families but the elders of the camp said we were lying; that there was nothing, that we should calm down. Upon our insistence the elders decided to go see what was going on. The elder men never came back to the mosque. After waiting in the mosque for few hours with no news about the elders we and other families went to Gaza hospital at the the entrance to Sabra. “We used to live in the street of Hay al-Gharbi next to the Doukhi grocery store. In our neighborhood only my family and our neighbor survived the killing, the rest were all killed. I remember seven or eight corpses on top of each other, in the street below our building; we had to step over them. “The Israelis and Phalangists led us in a march, to finish us, to kill us like they did to the others. Luckily, we managed to escape through the alley. The Israelis were dressed in full military uniform with iron helmets. The Lebanese militants were dressed in cowboy hats, blue jeans and daggers hanging from their belts. Some among them wore black ski masks. All carried Kalashnikovs. 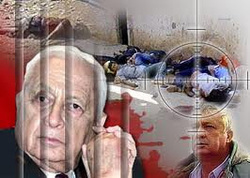 Putting Sharon in the dock “A few years ago 300 of us hired the lawyer Shibli Mallat to sue Ariel Sharon [Israel’s defense minister in 1982, and later, prime minister] for the massacre and we wanted to take him to a tribunal in Belgium. We saw pictures of Sharon standing at the sports stadium next to Israeli tanks overlooking the camp, and we know he was watching the massacre and the killing of Palestinians. I still want Sharon to be put on trial even if he, ironically, has been in a coma for years and clinically dead. “Thirty years after the massacre, take a look at how we live. We are seven people staying in two small rooms. Our life has been deteriorating for the last 30 years; we still can’t work and can’t move outside the camp to a decent place. We buy drinking and washing water on a daily basis. We buy electricity from a generator; the Lebanese government only gives us two hours of power a day. My two sons work at an aluminum factory. Because they are Palestinian they get paid less than their coworkers. And my 23-year-old daughter works at a café. “My daughter went to get a loan from a bank like her coworkers did but when she got to the bank and showed her papers they told her, ‘Sorry, you can’t get a loan because you are Palestinian.’ Being a Palestinian in Lebanon is a daily, ongoing struggle for survival. That’s why each time a woman gives birth we make sure the newborn is brought up to believe in the right of return to Palestine and we emphasize that we are only guests here. “We want to return to Palestine but until then I want to leave this country and go anywhere we’ll be treated as human beings. We never gave up, Palestine is ours, and we are going to return, but we are tired of not being able to live an honorable, decent life. Atrocity ignored On 16 September this year, Pope Benedict XVI visited Beirut, where he urged the Lebanese — both Christians and Muslims — to coexist in peace. The pope preached on various issues concerning the region but failed to mention the Sabra and Shatila massacre and the plight of Palestinian refugees in Lebanon. Many were furious with his omission of any reference to the massacre in his public address on Beirut’s waterfront. As he was speaking on the anniversary of the massacre, the omission was all the more hurtful. The Sabra and Shatila massacre is one of many atrocities that occurred during the long years of the Lebanese civil war. Ironically, political leaders, who were then warlords, were sitting on the frontline on Sunday during the Pope’s sermon; among those leaders were members of the Phalangist party, who are believed to be responsible for the massacre in Sabra and Shatila. There will come a day when Lebanon will break the taboo of the Sabra and Shatila massacre and justice will be served to the families of the thousands killed 30 years ago. But until that day comes, Palestinian refugees will still be marginalized, living in inhumane conditions inside overcrowded camps. An investigation by Beirut-based British journalist Robert Fisk, who was one of the first people on the scene after the massacre ended, concluded that 1700 people died. 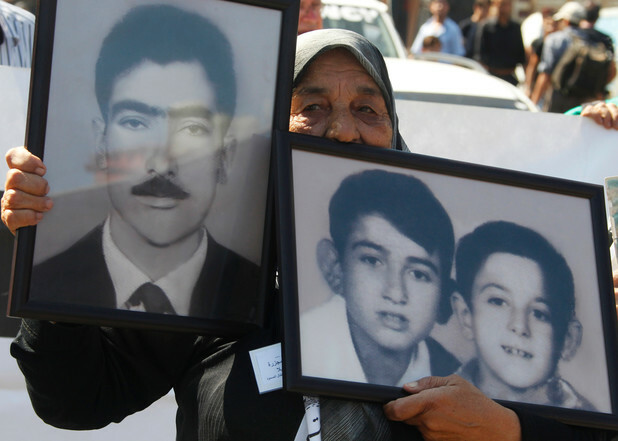 Thirty years ago, a massacre occurred in Beirut’s Sabra and Shatila refugee camps. The following declassified documents reveal conversations between high-level American and Israeli officials before, during and after the event. These English-language documents were released by the Israel State Archives in Jerusalem earlier this year. 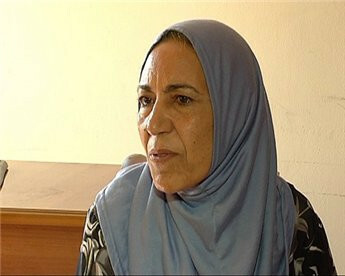 Rihab Kanaan bursts into tears while talking to Ma'an's reporter in Gaza about the trauma she suffered after losing her son and dozens of family members in the notorious Tel al-Zaatar and Sabra and Shatila massacres during Lebanon's civil war. The Gaza-based poet says the Palestinian leadership has forgotten about the Sabra and Shatila massacre in which an estimated 800-3,000 Palestinian civilians were killed by Lebanese Christian militias over a three day period on September 16, 1982. "I will hold two candles and a poster on which I will write: We are the martyrs of Sabra and Shatila, don’t forget us. I will stand in the Unknown Soldier Square in commemoration of my son Mahir and all martyrs," she said. Kanaan witnessed the Tel al-Zaatar refugee camp massacre during Lebanon's civil war in 1976 and later wrote a book about the events. She lost 51 relatives when the Beirut camp was besieged by Lebanese armed forces. 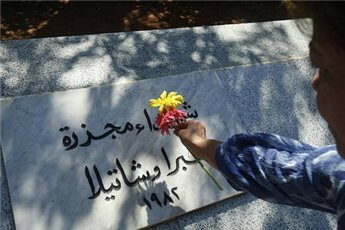 Years later, the Palestinian poet lost her son Mahir and two cousins in events in Sabra and Shatila. "He was going to buy bread when they killed him inside the camp’s mosque before the very eyes of his sister. Up until now, when I see a mosque, I remember how Mahir died." Kanaan was living with her second husband near the Arab University of Beirut at the time of the attack and remembers the tensions in Lebanese society. "We knew there were signs of unrest especially after the speeches of Bachir Gemayel. Then after Gemayel was assassinated, we were sure there would be a massacre, but we never imagined it would be as horrible and as big as that," she says. "When I was there, I heard about the massacre. I tried to go to Shatila, but I couldn't. After some effort, I managed to reach the outskirts of the camp where I saw the dead bodies and the atrocious scenes. The stories I heard from witnesses were too horrible that I couldn’t continue to listen," she recounts. Kanaan was certain her daughter had also been killed in the massacre and amid the confusion afterwards was unable to find out what happened to her. It was only some years later that she found out that her daughter Maymana had survived the attack and was taken care of by neighbors. Palestinian resistance fighters had already left the camp before the massacre, leaving only unarmed men, women and children, Kanaan said. Several years after the attack, Kanaan moved to the Gaza Strip. As another anniversary of the massacre passes, she is calling upon international human rights groups, together with Arab states, to hold the perpetrators accountable. "Two years ago, I visited Lebanon to pray to God on behalf of the martyrs from my family, and it was painful to see that nothing has changed in Sabra and Shatila," she says. "Life is still intolerable in all refugee camps, but people are still dreaming they can return to their homeland." The massacre took place after the Israeli invasion of Lebanon, when Christian Phalangist militias entered the Beirut camp under Israeli military watch to wreak retribution for the alleged assassination of their leader Bachir Gemayel. Over three days, Palestinian refugees were killed in droves. At the time, the number of dead was estimated at 700, but eyewitness British reporter Robert Fisk says the number is closer to 1,700. The Palestinian Red Crescent estimates that around 3,000 civilians were killed. On the 30th anniversary of the massacre of Palestinian refugees in Lebanon's Sabra and Shatila camp, a Palestinian official stressed that no one has been brought to justice. "Those responsible for slaughtering thousands have not been punished and Palestinian refugees continue to be denied their homeland," PLO official Saeb Erekat said in a statement Sunday. He urged the international community to ensure that the rights of Palestinian refugees to "return, restitution and compensation" are respected. He continued: "In 1982, foreign reporters wrote: 'How many Sabras and how many Shatilas will be needed for the world to put an end to this injustice?' Since 1982, many Sabras and Shatilas have occurred and they all have the same components: blood and impunity." The Palestinian Red Crescent estimates that 3,000 civilians were killed. Israeli soldiers in control of the perimeter of the camps did not stop the slaughter, firing flares overhead at night to aid the Phalangist gunmen. An Israeli investigation found then defense minister Ariel Sharon guilty of failing to prevent the deaths of innocent civilians. He was demoted but later became Israeli prime minister. The Phalangist leadership never apologized for their involvement in the massacre, one of the bloodiest events in Lebanon's 15-year civil war which claimed 150,000 lives. Thirty years after 1,700 Palestinians were killed at the Sabra and Chatila refugee camps, Robert Fisk revisits the killing fields. The memories remain, of course. The man who lost his family in an earlier massacre, only to watch the young men of Chatila lined up after the new killings and marched off to death. But – like the muck piled on the garbage tip amid the concrete hovels – the stench of injustice still pervades the camps where 1,700 Palestinians were butchered 30 years ago next week. No-one was tried and sentenced for a slaughter, which even an Israeli writer at the time compared to the killing of Yugoslavs by Nazi sympathisers in the Second World War. Sabra and Chatila are a memorial to criminals who evaded responsibility, who got away with it. Khaled Abu Noor was in his teens, a would-be militiaman who had left the camp for the mountains before Israel's Phalangist allies entered Sabra and Chatila. Did this give him a guilty conscience, that he was not there to fight the rapists and murderers? "What we all feel today is depression," he said. "We demanded justice, international trials – but there was nothing. Not a single person was held responsible. No-one was put before justice. And so we had to suffer in the 1986 camps war (at the hands of Shia Lebanese) and so the Israelis could slaughter so many Palestinians in the 2008-9 Gaza war. If there had been trials for what happened here 30 years ago, the Gaza killings would not have happened." He has a point, of course. While presidents and prime ministers have lined up in Manhattan to mourn the dead of the 2001 international crimes against humanity at the World Trade Centre, not a single Western leader has dared to visit the dank and grubby Sabra and Chatila mass graves, shaded by a few scruffy trees and faded photographs of the dead. Nor, let it be said – in 30 years – has a single Arab leader bothered to visit the last resting place of at least 600 of the 1,700 victims. Arab potentates bleed in their hearts for the Palestinians but an airfare to Beirut might be a bit much these days – and which of them would want to offend the Israelis or the Americans? It is an irony – but an important one, nonetheless – that the only nation to hold a serious official enquiry into the massacre, albeit flawed, was Israel. The Israeli army sent the killers into the camps and then watched – and did nothing – while the atrocity took place. A certain Israeli Lieutenant Avi Grabowsky gave the most telling evidence of this. The Kahan Commission held the then defence minister Ariel Sharon personally responsible, since he sent the ruthless anti-Palestinian Phalangists into the camps to "flush out terrorists" – "terrorists" who turned out to be as non-existent as Iraq's weapons of mass destruction 21 years later. Sharon lost his job but later became prime minister, until broken by a stroke which he survived – but which took from him even the power of speech. Elie Hobeika, the Lebanese Christian militia leader who led his murderers into the camp – after Sharon had told the Phalange that Palestinians had just assassinated their leader, Bashir Gemayel – was murdered years later in east Beirut. His enemies claimed the Syrians killed him, his friends blamed the Israelis; Hobeika, who had "gone across" to the Syrians, had just announced he would "tell all" about the Sabra and Chatila atrocity at a Belgian court, which wished to try Sharon. Of course, those of us who entered the camps on the third and final day of the massacre – 18 September, 1982 – have our own memories. I recall the old man in pyjamas lying on his back on the main street with his innocent walking stick beside him, the two women and a baby shot next to a dead horse, the private house in which I sheltered from the killers with my colleague Loren Jenkins of The Washington Post – only to find a dead young woman lying in the courtyard beside us. Some of the women had been raped before their killing. The armies of flies, the smell of decomposition. These things one remembers. Abu Maher is 65 – like Khaled Abu Noor, his family originally fled their homes in Safad in present-day Israel – and stayed in the camp throughout the massacre, at first disbelieving the women and children who urged him to run from his home. "A woman neighbour started screaming and I looked out and saw her shot dead and her daughter tried to run away and the killers chased her, saying "Kill her, kill her, don't let her go!" She shouted to me and I could do nothing. But she escaped." Repeated trips back to the camp, year after year, have built up a narrative of astonishing detail. Investigations by Karsten Tveit of Norwegian radio and myself proved that many men, seen by Abu Maher being marched away alive after the initial massacre, were later handed by the Israelis back to the Phalangist killers – who held them prisoner for days in eastern Beirut and then, when they could not swap them for Christian hostages, executed them at mass graves. And the arguments in favour of forgetfulness have been cruelly deployed. Why remember a few hundred Palestinians slaughtered when 25,000 have been killed in Syria in 19 months? Supporters of Israel and critics of the Muslim world have written to me in the last couple of years, abusing me for referring repeatedly to the Sabra and Chatila massacre, as if my own eye-witness account of this atrocity has – like a war criminal – a statute of limitations. Given these reports of mine (compared to my accounts of Turkish oppression) one reader has written to me that "I would conclude that, in this case (Sabra and Chatila), you have an anti-Israeli bias. This is based solely on the disproportionate number of references you make to this atrocity…"
But can one make too many? Dr Bayan al-Hout, widow of the PLO's former ambassador to Beirut, has written the most authoritative and detailed account of the Sabra and Chatila war crimes – for that is what they were – and concludes that in the years that followed, people feared to recall the event. "Then international groups started talking and enquiring. We must remember that all of us are responsible for what happened. And the victims are still scarred by these events – even those who are unborn will be scarred – and they need love." In the conclusion to her book, Dr al-Hout asks some difficult – indeed, dangerous – questions: "Were the perpetrators the only ones responsible? Were the people who committed the crimes the only criminals? Were even those who issued the orders solely responsible? Who in truth is responsible?" In other words, doesn't Lebanon bear responsibility with the Phalangist Lebanese, Israel with the Israeli army, the West with its Israeli ally, the Arabs with their American ally? Dr al-Hout ends her investigation with a quotation from Rabbi Abraham Heschel who raged against the Vietnam war. "In a free society," the Rabbi said, "some are guilty, but all are responsible."